Ummm….hi. It’s been a while. A looong while. In August I thought I was going to get back in the swing of blogging and it just never happened. It’s not that I haven’t been cooking…but while I was pregnant my priorities shifted. First, the focus shifted to just getting food in my mouth, not pausing to take a photo and write a recipe. As I neared the end of my pregnancy, my focus shifted to making large batches of soups, stews, and easy-to-freeze dishes like manicotti to get me through the early weeks of motherhood. 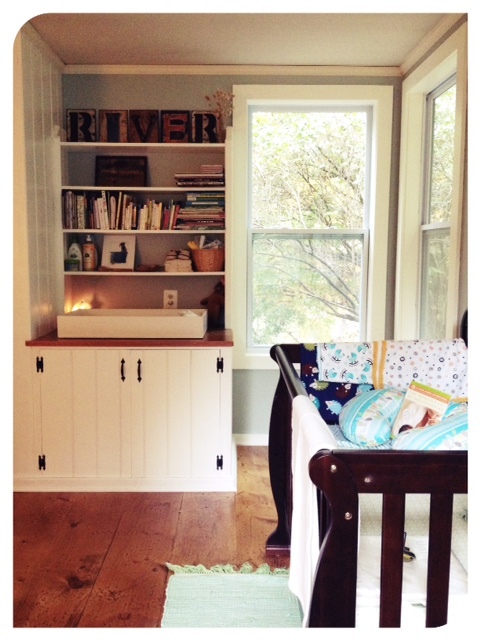 We were also in the midst of frantically working on a major home project…the baby’s room. What started with a simple home improvement project (putting down new flooring and painting the walls) ended up turning into a major project, replacing windows, tearing the room down to the studs, and working on the roof. My work life became very busy as I worked toward having a couple of months off of leave. And when it came down to it, my blog fell by the wayside. After all, the most important thing I had to cook was this little guy. 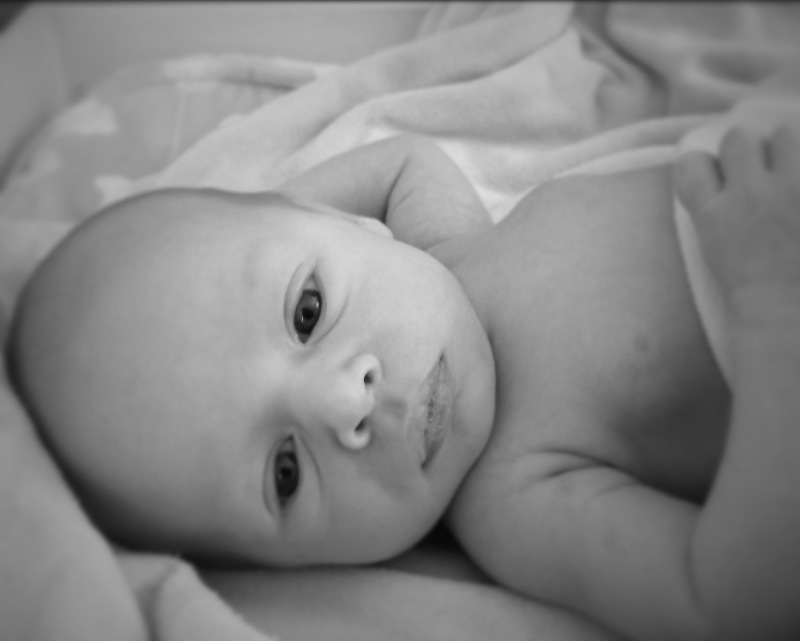 River Wilder Nelson was born four weeks ago and my life has become consumed with feeding, diapering, and staring at my sweet baby. Can you blame me? As a way to cope with all of the busyness and life changes, I have become a very practical cook in recent months. This recipe I’m about to share is about as practical as it gets. It is my take on one of Cooking Light’s most popular dishes, Toasted Guajillo and Pork Posole. It’s a great way to use up Thanksgiving turkey leftovers and can easily be adapted if you have leftover pork or chicken. It’s a refreshing change after eating turkey, stuffing, and mashed potatoes until they come out of your ears. Not to mention, it’s very budget friendly and healthy to boot. I flavor my posole with toasted guajillo salsa, which has been a staple in my house for the last several months. It is SO good. We use it as a flavor booster in soups, as a salsa with chips, on top of tacos and enchiladas, and with my baked eggs with kale and mushroom skillet on weekend mornings. It freezes well so I make a double batch. I’m even thinking about giving it away at Christmas with a jar of tomatillo salsa (red and green for Christmas!). 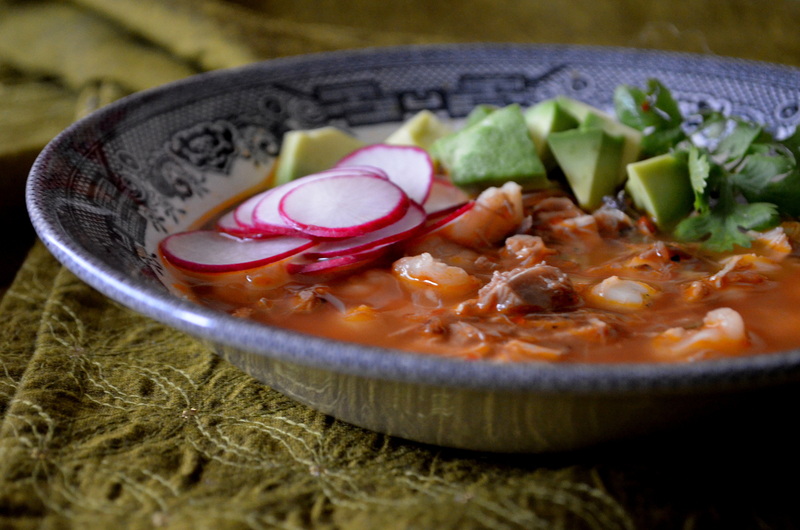 So I highly recommend you make a batch and use some of it in this posole. If you aren’t into making some of this salsa, see my note at the bottom of the recipe for another way to use chiles in this recipe. Treat this like chili when thinking choosing your toppings. I like radishes, cilantro, sour cream, and avocado on mine. Crumbled tortilla chips are also a nice addition. Whatever you like! I hope you enjoy. It’s good to be back! Add oil to dutch oven/large soup pot and heat over medium-high heat. Add garlic and onion to pot and stir frequently for five minutes, until onions and garlic are softened and lightly browned. Add half of the broth, cumin, cloves, salt, and pepper. Using an immersion blender, blend until smooth. If you don't have an immersion blender, pour contents into a blender and blend until smooth, then pour back into the pot. Add remaining chicken stock and water. Add guajillo chili salsa and 1 tablespoon adobo sauce; reserve the chipotle chiles from can and remaining sauce for another use (I freeze mine in small quantities). Stir in hominy and turkey, chicken, or pork. Bring to a boil; cover, reduce heat, and simmer for 10 minutes. *Note: If you don't feel up for making a batch of guajillo chili salsa, you can use the following method: put 3 chiles on a baking sheet, bake at 400° for 4 minutes or until dark. Cool; remove stems and seeds. Place in a blender with 1 cup of liquid from soup pot and puree. Add to soup. First of all Congratulations Aura and Drew! So happy for you and the new family of three that you have become! How beautiful and exciting! Can’t wait to try this recipe with our leftover Thanksgiving turkey. Do you think it would suffer any if I substituted corn I cut from the cob and froze this summer, for the hominy? I have never had hominy, so do not know what the difference would be. Any thoughts? Hi Patty! Thank you!! It is all very exciting :). Hominy I as corn that undergoes a special process. It has a denser texture than corn and is about double the size. If you don’t have hominy though, corn can be used as a substitute. Chickpeas might also taste really nice in this because they have that dense texture also. Enjoy! Thanks Aura. Now you have me even more curious about hominy! I had read that it is treated with lye, lime and ash and I guess that kind of scared me off- what with lye being used and all… but your description of texture and size makes it sound rather intriguing now and I do want to try it. Do you know if Meijers sells it? Thanks, Aura! Can’t wait to try it! This is absolutely delicious, Aura! So much depth of flavor! Yum, yum, yum!!! What an excellent use of leftover Thanksgiving turkey! We may have to eat more turkey here, just so I can make this recipe more often! Thanks for sharing! p.s. I omitted the water in this recipe, since it looked like it was going to be a nice consistency without it, and that worked really well. Thought I would share this, since it has worked out so well: I have been using boneless skinless organic chicken thighs in this recipe with great success. I think that dark meat chicken has enough depth of flavor to substitute in for the turkey or pork. White meat would not be as tasty in this recipe, I believe. Just bake the thighs in a 350 oven while prepping the other ingredients, until they are cooked through, then cut into bite size pieces… This recipe has become a regular on our menu here, it is just So Incredibly Delicious, always topped with the avocado and cilantro, it has very quickly become a favorite. By making and freezing batches of the guajillo salsa, it’s a really quick and easy meal. Be sure to include the seeds in your guajillo chili salsa. I omitted them one time, and the posole was definitely lacking that nice extra punch.